Happy birthday Teenage Mutant Ninja Turtles! April 23 the heroes in a half shell celebrated their 25th anniversary. New York City paid homage to the fictional heroes by lighting the Empire State Building green. The anniversary was also marked by an announcement from Peter Laird that a new live-action film exploring the turtles origins would be released in 2011. No further details are available at this time but hopefully Rob Van Winkle will be available to reprise his role from the second film. You’re taking it too far! Last year, brothers Barney and Daniel Jones founded the UK Church of the Jedi – which offered sermons on the Force, lightsaber training, and meditation techniques. Buffy movie Coming soon? Skeptical? Very. Still excited? Hell yeah! Mass extinctions occur repeatedly, though irregularly, throughout Earth’s history, and occasionally these extinctions have been devastating to life on our planet – or have they? On its jagged shores have blown. About an island near the Galoos. Unfreed in their struggling throes. A sailor’s last Port of Call. In a harbour fair, safe port at last. This took me about a day to pull together, from conception to finished product. 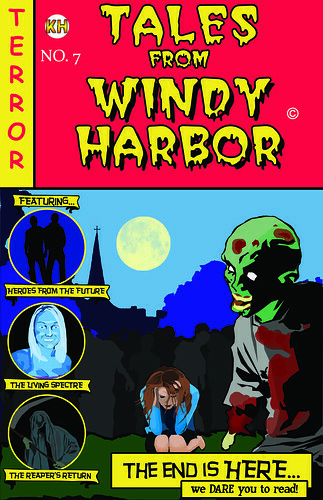 Windy Harbor is the series of scripts I’ve been writing since 2002. The episode I’m currently working on for Script Frenzy 09 takes a step into the bizarre. Sam, the headstrong female of the group gets whisked into the future, giving her a glimpse of the hell that will unfold if certain pieces of the puzzle fall from place. In order to motivate myself and set the mood, I decided to make a faux comic book cover as the episode storyline has a decidedly ‘comic’ feel to it. Tales of the Crypt just felt right from the beginning.